2.0's Hindi version has already made Rs 122.50 crore in India, adding significantly to the movie's collection. From the looks of it, the year is likely to end in a high note for the Indian box office, thanks to 2.0. While Thugs of Hindostan proved to be a dud, 2.0 seems to have taken it upon itself to revive box office collections. On its sixth day, 2.0 is still running strong in both Indian as well as international markets. Rajinikanth's 2.0 has made more than Rs 450 crore worldwide in six days and is nearing the much-coveted club of Rs 500 crore. In Kerala, 2.0 has crossed Sarkar's lifetime business already to become the highest-grossing Tamil/Telugu movie of all time. Rajinikanth's 2.0 has made Rs 14.1 crore in Kerala so far. In Chennai, 2.0 becomes the highest-grosser of Rajinikanth so far with a collection of Rs 12.58 crore. When it comes to international markets, 2.0 is sailing smooth. 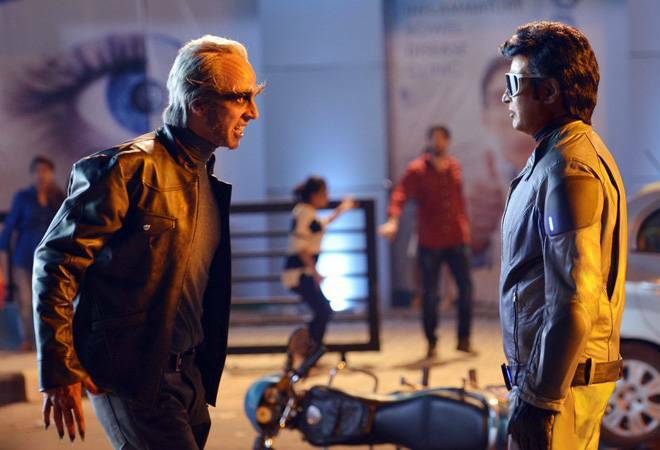 Rajinikanth-Akshay Kumar's sci-fi has made $4 million in USA, becoming the second Tamil movie to do so after Kabali. According to trade analyst Ramesh Bala, 2.0 will overtake Kabali after the coming weekend. The Hindi version of 2.0 has fared much better than what was initially expected. It has already made Rs 122.50 crore in India, adding significantly to 2.0's collection. Enthiran's sequel, 2.0 made Rs 20.25 crore on Thursday, Rs 18 crore on Friday, Rs 25 crore on Saturday, Rs 34 crore on Sunday, Rs 13.75 core on Monday and Rs 11.50 crore on Tuesday. Shankar's 2.0 is expected to run smoothly for another week. However, Sara Ali Khan's Kedarnath that is releasing in the coming weekend is expected to be strong competition for 2.0. Made on a budget of Rs 540 crore, 2.0 is India's most expensive movie. Backed by Lyca Productions, 2.0 has been released across 10,500 screens globally. According to reports, 2.0 is proving to be a family entertainer. Additionally, both the superstars' fan base is rushing to watch the movie that has received mostly positive reviews. Fans of the first part, Enthiran or Robot, have also made their way to the theatres to watch their favourite Chitti in action. The movie's stellar VFX too has garnered a kind of interest in the movie that is seldom witnessed in Indian cinema, directing more and more people to the ticketing counters. It remains to be seen how many more records 2.0 is about to break and create in the coming days.